Baklava is a popular culinary temptation which you just can not resist and you will always want another piеce. 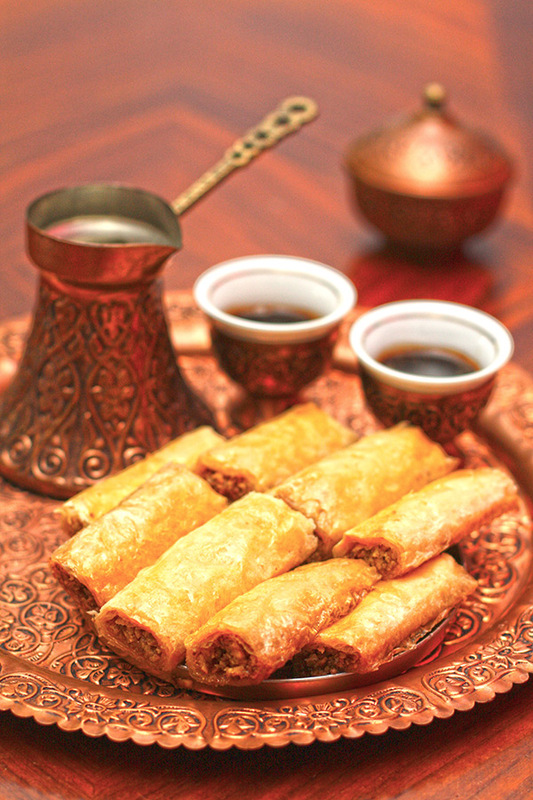 Turkish sweet pie is the perfect partner for every cup of strong coffee and a tempting dessert for a rich table. Creating the perfect combination of crispy thin pastry, chopped nuts and a sweet sugar syrup is a challenge in the kitchen. But with the right recipe from your kitchen will always comes out perfect baklava which will instantly disappear from the plates. ~ Place all the ingredients under 'filling' in a bowl. ~ Combine until blended. Meanwhile place all the ingredients for the syrup together in a saucepan and bring it to a boil, while stirring for the sugar to dissolve. Simmer for 10 minutes and leave it to cool. ~ Brush a 12X10 in baking dish with butter. Brush 10 sheets of filo with melted butter. ~ Lay them on the dish one by one. ~ Spread the filling in the dish. ~ Now top it off with further 10-12 sheets of pastry, buttering each sheet as needed. You can trim off the excess pastry hanging on the side of your baking dish. Now brush the top of the pastry with more butter. ~ With a sharp knife, score the top layers in large diamond shapes. ~ Bake in a preheated 160C (325F) oven for 1 hour or until the top turns golden brown. ~ If you find that the top is turning color too quickly, then cover the top with foil. ~ Remove from the oven and slowly pour the syrup over the top. ~ Now comes the MOST DIFFICULT part. You have gotta to let it sit for at least 5-6 hours for it to absorb the syrup. ~ It’s best not to put Baklava in the fridge. Just cover with foil or something similar. ~ Then make yourself a coffee, sit down, put your feet up, and try a piece.